Please know that WE ARE NOT affiliated with "Vacation Rental Pros!" WE ARE NOT affiliated with "Vacation Rental Pros!" Couldn't be nicer to deal with! This is a fantastic rental home and the owners couldn't be nicer to deal with! We'll be back again next year. Thanks again Carolyn and Bob! We really enjoyed our stay in this home. The home is very charming with lots of personal touches. The bathrooms are a bit small, but the location is outstanding. Also, many homes we have rented do not have a screened in porch....this house has 3!!! porches, one on the roof, and 2 on the 2nd level, one of which is screened. We sat outside every single morning enjoying the view without having to be in the sun. Bob and Carolyn could not have been better hosts. We had an issue with the air conditioning, which was resolved within hours of my letting Bob know. If you are looking for a place to relax, enjoy your time on the beach and not worry about details, rent this home! We have just come back from a week long stay at this wonderful beach home. Like the others have commented, this is an older "Florida" beach home that was exactly what we were hoping for. It is very quaint, extremely clean, and the most perfect place to rest, relax and rejuvenate! The bedrooms we're perfect for our family of 7, but would easily sleep 12 or more. The downstairs bedroom was perfect for our young adults and the on suite bath made it even better. This home has everything and more that you could want in a rental, with all the room, appliances, dishes, pots & pans, towels, sheets, and the most beautiful views of the ocean...which we lived the sunrises each morning. The upper deck was enjoyed by all. Even my 76yr old mother climed the stairs for the views. I can't say enough about this home and the owners. They were super nice to talk with and very accommodating. They worked with us, letting us come in on a Sunday to Sunday and when we had an issue with the A/C, it was taken care of immediately! We plan on renting again in the very near future! Thank you to the Amon's for allowing us to stay in their home!! We stayed at this amazing oceanfront home in October and had a wonderful experience. Bob and Carolyn are very helpful with any questions we had. The pictures really don't do justice to this home. The views and upkeep can't be matched. We've stayed at many rentals along Atlantic View and I can honestly say this is the best value we've ever experienced. And they don't charge all the extra fees like the some of the management companies do! We're looking forward to staying again next fall and have already rolled over our deposit for 2018. Wonderful house. Nicely stocked and very clean. We enjoyed this home. We were looking for a place that was relaxing, comfortable, beach front and not too far away from activities and shopping. This house surpassed expectations. It was clean from the inside to the outside, well maintained, the kitchen well stocked and everything was working and in good condition. All of these things made this house a home and our vacation everything we hoped it would be. Bob, the owner was great from beginning to end. Bob you delivered. We'll do it again next year! Bob & Carolyn are very kind & generous hosts. Our rental was scheduled to begin the day after Hurricane Matthew struck the East Coast. It was unclear what we would find -- power was out, access to the area was restricted for a time, YouTube was filling with videos of storm-ravaged areas. We were quite concerned about our vacation, to say the least. Bob was very understanding and offered a refund to us without delay. We were sorry that we could not stay at their place in 2016, but look forward to 2017! Wow, wow, wow. If I could give this place more than five stars, I would. Our family of seven stayed there a week and couldn't have had a better time. The house is nice, clean and comfortable without being stuffy and uptight. The beamed ceilings were especially nice. The sun decks and the shaded, screened porch also got plenty of use. With the large east-facing windows, it was possible to catch a sunrise while indoors sipping coffee -- awesome. The street is quiet, the beach close, but if you want more people and more action, it's just 10 minutes down the street. Oh, and Bob and Carolyn couldn't be better hosts. They even called (on a landline) to make sure everything was OK. It was a nice touch. If you rent this place, you will not be sorry. My only regret is the week went by so fast. There is so much room for parking. The home is so cheery and bright. Big windows to let in lots of light. The view of the ocean from the living room porch is breath taking and the views only get better as you walk up to the highest porch. It's everything Bob and Carolyn said and more. The living room has comfortable furniture. The kitchen is so well equipped and there is a big table to accomodate many people. We only used the screened in porch once because the weather was so nice. The bedrooms are spacious and the beds are very comfortable and the bathrooms were very nice. The down stairs room with bath is great for another couple to have their privacy. We didn't use the game room because we were always in downtown St Augustine or at the ocean. It's nice to have a full sized washer and dryer. The Township walk is very close to the house and is well kept and easy to walk to the ocean. We were up every morning to see the sunrise on the beach. Their cleaning crew is amazing my hats off to them. Bob and Carolyn were so easy to work with before our vacationa and during it. Their were 5 adults and we all had such a wonderful time. Bob and Carolyn your hard work shows in your beautiful home. We can't wait till we can come back. This was one of the most PLEASANT EXPERIENCES I've ever had. THIS PROPERTY AND OWNERS ARE A+++++!!!!! What an EXCEPTIONAL experience this vacation home turned out to be! By far, the cleanest and most comfortable accommodations we’ve had thus far in ocean front properties! Plenty of room in a well designed floor plan. Location was most convenient to the beach and shopping and adventures. Owner is attentive and responsive. The kitchen is well-equipped and the furniture and beds comfortable… the decorating is as soothing as the ocean views! You won’t want to leave the top deck except to venture out on the very quiet beach or back into the house… the perfect place to relax and recharge. Local public beaches are pristine and shell-stocked, and the close-by shopping makes trips for necessities painless. I will definitely return to this most congenial/hospitable owner’s home if I find myself back in St. Augustine… a wonderful place to begin a day of adventures in the area and a quiet sanctuary at day’s end. In order to have a family Christmas, we needed to travel close to Gainesville, Florida so kids could drive over easily for their one day off. Wanted a home with a beach view and enough room to accommodate the whole family including our grandpuppy. After walking through the house after our arrival, our daughter declared that it was an "awesome" house. Indeed it was! The home was beautifully, yet comfortably decorated. The kitchen had everything I needed to cook Christmas breakfast and lunch. With the unusually warm holidays it was nice to have good ac and fans as well as a great ice maker. The Amons were wonderful to work with in planning our trip! Bob gave us excellent information on the area and was only a phone call away if needed. But we didn't need him because their home was all ready for us. The best part was how accommodating they were about our grandpup. So nice to have truly pet friendly owners who recognize that there are responsible pet owners out there. The beach and neighborhood were also very dog friendly. Made for an enjoyable vacation holiday. We also enjoyed the wildlife on the dunes. Especially enjoyed the gopher tortoises. Saw some beautiful sunrises from the numerous decks as well. Wonderful home and wonderful owners made for a fabulous Christmas vacation! Being frequent visitors to St. Augustine Beach, my family and I consider ourselves well versed in selecting accommodations for our Thanksgiving gathering. This year we hit the jackpot! The owners have considered every need a guest could want and having rented many properties over the years, we NEVER were treated to sea turtles ambling along in the dunes behind our rental. The rooftop deck allowed us to watch horses and their riders enjoy the beach and family members took fishing gear and caught enough fish to feed all of us for a great meal. It's all right here and the Amons are gracious hosts, on call if you need them but respectful of ones privacy too. The view alone is worth the visit. This beach house is a keeper! We rent a house on a lake or the ocean every year for our growing family and this was by far the nicest home we have stayed in. For a family of 8 (two and four year old grandchildren, their parents, grandparents and twenty somethings) it was the perfect place. The common area is large enough for everyone to sit around the table or in the living room and relax. The kitchen was large and well equipped for cooking family meals. The bedrooms are separated enough for everyone to go to bed early or sleep in and not be disturbed by other people in the house. And did I mention how wonderful it is to get up in the morning and watch the sunrise over the ocean or a full moon shining on the water from one of two decks or screened in porch? It is clearly a home that the owners use themselves as it has extras you don't get in most standard rentals: ping pong table, sand toys, a box of kids toys, books and puzzles. The walkway to the beach is so close and when you return all covered with sand you can use the wonderful outdoor shower. There are plenty of towels (including beach towels), bed linens and blankets with a handy washer and dryer—just about everything you would have in your own home. It has a nice beach vibe without too many decorations, comfortable and very clean. The rental process was very simple and everything was even better than described. Will definitely be back again. This has been the best experience in a rental in our years since 2012 coming twice to three times yearly to Saint Augustine and the JAX area due to my Mayo Clinic appointments. The accommodations were superb. The neighborhood was quiet and the neighbors delightful. We sat on the top deck and watched turtles nesting in the yard next door, caught the wonderful Atlantic breezes and watched the Harvest Moon make its rise out of the Atlantic to light up the night. The only time we even heard traffic was on Monday morning garbage day. They had everything you need from iron and ironing board to hairdryers to umbrellas and a vast assortment of beach chairs, kites and toys for the little ones. Only time I can remember enjoy doing the laundry, come down with a book and coffee and do the wash while having quiet time under a covered deck downstairs and even have a clothesline to let the ocean breezes dry your clothes if you wish; being a Kentucky girl, I do love a clothesline. The kitchen was decked out with everything you needed for your cooking needs and with televisions in each bedroom with great quality and ease of use; we really loved Comcast too as having stayed in many houses the WiFi reception is pretty bad, but not here. I got good news from Mayo and will not be returning for a year, and the moment they tell me the date we hope to rent again. When we left after almost a 1-month stay it was with great sadness as we actually felt like we could have just stayed there forever; it as truly as if we were leaving home. I have tried to put into words our experience at Atlantic View, this lovely rental. Perfect For Our Family Beach Vacation! This comfortable and clean house was perfect for our family vacation. Everyone had such a great time - the area has a lot to do, and the downstairs suite was a nice place for the teenagers to hang out and play ping pong. The owners are great to deal with and everything went smoothly with the rental. Would love to do it again! Charming House! Epic Family Vacation! This house had EVERYTHING we needed from convenient beach access, amazing views, fun for the kids, and everything was clean and well maintained. We all had a wonderful time and can't wait to book a return trip for next year! "Very Comfortable - Great Location"
Great family location, everyone enjoyed this house so much. We will be booking another family vacation here. Thanks so much! An outstanding location and the house had all the amenities. The property was very clean and neat, but the building is old and needs some modernizing. The owners own the building only a few years and they are working hard to update the house. They are exceptionaly nice and provided outstanding customer service. We would definitely recommend this property to friends and relatives and would rent it again ourselves. The beaches are fantastic and the sights in the area are wonderful: Old Town St Augustine, St Augustine Wild Reserve (awesome, but not well known); and the Marineland Dolphin Adventure. A great vacation! We thoroughly enjoyed our stay at your beach home. The house is very well furnished and the décor is tasteful and appropriate to its seaside location. It is obvious that careful thought has been given to the needs of the guests. Located close to the beach and only a short drive to historic St Augustine we have no hesitation in recommending to our family and friends. Great location in wonderful family neighborhood. Best beach on north Florida Atlantic coast. Well supplied house and nice for large family. Great views of ocean. Really enjoyed our stay at your beach house! The house was very clean. Great access to the beach. Really enjoyed the upper deck for sunbathing. Plenty of beach chairs. Great location to downtown! Well maintained house, well stocked kitchen! Three brothers and wives spent one week together in this great location house. Sitting on the screened-in porch or deck was pure pleasure. It was so easy to go into St Augustine or find restaurants from here. Being on the ocean and an easy walk to stick our feet in the water-again GREAT! The home is located in a nice quite, safe neighborhood away from the noise of A1A, and it has an ocean view from the screened in back porch. The upper deck is wonderful for sunning and an even better view. The drive to St Augustine is a short 15 minutes. Many nice restaurants nearby. We can't say enough wonderful things about the home and the owners, Bob and Carolyn. They sincerely want you to be comfortable and enjoy your stay. And we did! We'll be back next year! Another two months of fun at the beach! We just returned home to the winter weather of the Midwest after spending another two months in Bob and Carolyn's warm and cozy house on the beach. A fun time was had by all including our 2 dogs who looked forward to a beach walk every day or a swim in the Atlantic when weather allowed! We, along with all guests, enjoyed the coziness of the main living area and the comfort of the four bedrooms. The kitchen is well equipped although it could use another set of flatware for feeding larger groups. Other than this, no complaints and another 5-star review from us! The proximity to the beach access, awesome beach views from the 2 decks, the cozy house interior, and the friendly neighborhood make this an ideal setting for a family vacation. Bob and Carolyn are caring owners who we look forward to meeting in person some day soon! Wonderful Place To Stay !!! My family has been vacationing in St. Augustine for many years. We were so happy to have found this home! First, the location you can't beat! just steps from the beach, and the view is amazing, especially from the rooftop deck! It's also very close to restaurants and stores, which is extremely convenient. Second, it was wonderfully unexpected to have found a ping pong table, beach toys, and other great things for our kids to have to play with! They were so excited, and as parents we were happy to have them always happy and having fun! Finally, the home was so bright and clean. We felt right at home from the minute we walked in the door. We're hoping to be able to come back and stay at this same home next year! Thank you Bob and Carolyn for renting out such a wonderful place for our family to stay. Amazing view - Cozy house! My boyfriend and my fury babies spent one week in this cozy house. We loved the panoramic view of the beach from the top deck. My fury babies loved going up there and hanging with us. Bob and Carlyn were very prompt at answering all our questions which made our stay very pleasant and easy. The house had everything we needed. We had a great stay and would love to come back again! Great place to stay! The pictures are accurate, you will not be surprised. House was EXTREMELY CLEAN, well located (Publix 5 min, outlets 20 min, TPC Sawgrass 40 min, airport 1.25 hour). The beach is right in your back yard (accessible via a public footpath 2 doors down). Nice patio outside and great screened porch. The balcony on top has a fantastic view. Just be careful with the first step on top as it is not lined with the newel post. It is a bit dangerous if you are looking at the view instead of looking at the steps!! Beach chairs, boogie boards, beach towels, everything you need. Felt welcomed and felt that we could call if encountered any problems. Phone in the unit was also a plus for us. All in all I would strongly recommend this place to anyone! The property was exactly as pictured and described. We enjoyed the beach, the house and City of St Augustine, while traveling for a family wedding. Atlantic Dream was very clean, comfortable and very family friendly. 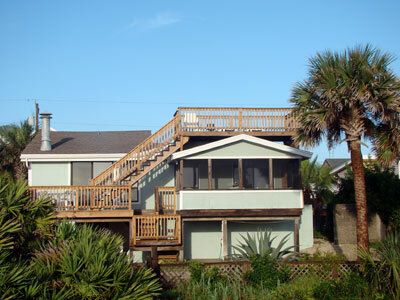 We enjoyed the screened-in porch and upper deck to watch the goings on of the beach. We used the kitchen to prepare most of our meals and found all of the necessary tools and place settings to feed 10 hungry people. The beds were very comfortable as well.We would most likely return to Atlantic Dream at a future date! Thanks for a great find!!!! Two wonderful months at Atlantic Dream! From the minute we walked in the front door, we were in love! Atlantic Dream was everything we were hoping for in a beach house to call our own for two months. Atlantic Dream is clean and well maintained, with a beach cottage decorating theme. It's clear that the owners care about their beach rental property. The kitchen is well equipped for making any meal, whether a quick lunch or an entire evening dinner. The dining and living room area is both comfortable and spacious. The 4 bedrooms are roomy and comfy, each with its own TV in case of bad weather. The screened porch and decks, with views to keep you entranced for hours, were perfect spots for sipping morning coffee, relaxing with a good book, and sharing conversation during evening cocktails. The beautiful beach was a short walk away and the perfect spot for playing ball with our two water dogs and swimming them in the ocean! The neighborhood is very dog friendly. The St. Augustine area is jam packed with wonderful restaurants! We enjoyed Black-fly, South Beach Grill, Beaches, Harry's, and Purple Olive, to name just a few. We also enjoyed going to the local fish market for the daily catch to fix at home! Tim's Wine Market has a nice wine selection, a friendly staff and Friday night wine tastings. The Atlantic Dream owners, Bob and Carolyn, were easy to deal with during the rental process and ready to help answer questions throughout our stay. And, there were NO surprise fees/charges which is not often the case with vacation rentals. We are already looking forward to our return visit to Atlantic Dream in 2015!!! We liked this rental so much I am compelled to write a nice review. We stayed here in November, 2013 with our extended family from Gainesville. First of all, Bob and Carolyn (the owners) couldn't be nicer and more reputable to deal with. I'd also commend the management company they are using. Between the owners and their management team, we were treated fairly and honestly and without any hassles or misrepresentations. Last year we had a very unpleasant experience with one of the larger online management companies in the area and we were ripped off mercilessly! On top of the rental amount of the condo we had picked out, they charged us a 4.95% "Amenity Fee" and also $195 "Security Damage Waiver Fee" and then $295 for Cleaning and then 10% Florida tax on all of that! Bob and Carolyn only charge the rental amount, a $200 Cleaning Fee and the 10% tax... nothing more. It was a real pleasure this time, dealing with a reputable owner and an honest rental management company. The house was immaculate and everything was ready, including all beds made and towels and linens done, but most of all, it was REALLY CLEAN! The house has everything you'd want in a rental: ocean front views, close to town and all the attractions and even close to a Publix! There are TVs in every bedroom and a large one in the great living room, which fit our entire family, by the way. Then there are 3 separate deck areas - one of them is completely screened in and seats 10 people and there is also a deck up on top of the house that has fantastic views all up and down he coastline! I would highly recommend renting this house from Bob And Carolyn. These folks really go out of their way to give you a good value for the money. We are definitely coming back again. Thanks Bob and Carolyn! My husband and I enjoyed our mini vacation with our dog at this lovely home! The owner is prompt in responding to inquiries and nice to speak with. The home was VERY clean and had everything we needed-and more! The house was perfect for our dog-there are plenty of spots outside to rinse off when coming in from the beach. The game room looked like a lot of fun for families. The set up of the home is so open and bright, we enjoyed the sound of the ocean and views from the deck, screened in porch, and crow's nest. The view is amazing and it is just two houses over from beach access. We enjoyed so many of the local restaurants and downtown St. Augustine. Thank you for a wonderful vacation! We stayed here in June, and the house is wonderful!! Everything you could want in a rental, and close to all the great restaurants and attractions. We especially loved the rooftop deck and the terrific views of the ocean. We are definitely going to return again soon. My parents wanted to take my sister and me and both of our families to St. Augustine for their 50th wedding anniversary. (It's where they honeymooned.) Trying to find accommodations for 6 adults and 4 children on the beach that wouldn't break the bank, but would also be clean and comfortable proved to be a bit of a challenge until my father came across the Amon's property. Very nicely updated and renovated 4 bedroom/3 bath home (3 bds/2 bath on the main level, 1 bd/1 bath on the lower level with exterior entrance in backyard). My sister, bro-in-law and their children took the 2 bedrooms with the queen beds, and there was enough room in one of the 2 bedrooms to also accommodate an air mattress on the floor. (She has one girl and two boys, ages 9, 7 and 6 at the time of the trip.) My husband and I ended up in the master bedroom and the closet was big enough to accommodate our 5 yr old's air mattress so that ended up being her "room." My parents willingly took the lower level bedroom with the twin beds because we all felt the children were too young to sleep in there by themselves, especially if one (or more) of them needed mom or dad during the middle of the night! Plenty of closet space, plenty of bath towels and beach towels provided (thanks!). Kitchen was well stocked and the pantry pretty clever! Plenty of seating for everyone for meals. We especially loved the screened-in porch in the morning: the half-awake adults could sit out there with their breakfasts while the kids watched cartoons inside with theirs. We were grateful for the blackout drapes in the master bedroom and would recommend them for all of the rooms if possible. Shower stalls in two of the bathrooms were pretty tight, but understandable given the original age of the house. Both were redone well and offered as much surface space as possible for toiletries. All of the rooms were comfortably furnished while still leaving enough floor space to accommodate suitcases and duffle bags. Great location, too. Close to grocery stores and easy distance to the downtown area (which we LOVED visiting!). Overall, great place and we enjoyed our stay! Thanks! It was a wonderful place for our family vacation. The best part of this home was it's location, right on the beach and easy access to any thing you would want to do or think about doing. The house was not luxury living but we just wanted a place that the young children would enjoy and we didn't have to worry about what they were getting into all the time. We could relax and enjoy the time. We also had a young puppy and this place was great for him. He loved being in the screened in porch and he enjoyed the back yard. Part of our family enjoyed staying on the porch because they love the fresh sea air and the sounds of the waves. The kitchen had everything you would need as far as equipment would go. We did have to sharpen the knives but that would be understandable with everyone using then. The house was clean and the beds were firm and comfortable. The bedroom on the first floor was nice for our family members with children to take naps although I'd recommend a sound system so you could hear when they wake up. The Crow's nest was a wonderful place to watch the ocean from sunrise to sunset. We enjoyed having the beach items on the property and having a place that would fit our family of 11. Also having Big Bill's rental place near was great for baby items and any beach items one would need. They are very helpful and deliver at any time. The word I would use for this property is location, location, location!!!!! We traveled to St. Augustine in January and the weather was perfect! The house was great! Everything you could want was provided for. The kitchen had every utensil, the rooms were clean and the beds were very confortable. The house was at a great location not far from everything! The church was 2 blocks away, The town was 7 miles, stores and restaurants were all a short distance from this wonderful house. Sitting on the beach or having mimosas on the deck, walking the dog, (there are 2 dog parks also not too far away) It was one of the best places to stay and I would definitely go back there.Thanks Again! -Anna C.
We totally enjoyed our week at Atlantic Dream. The house was clean and easy to enjoy with all the comforts of home. The upper deck was awesome to watch the sunrise or just to relax in the evening. The home is located in a nice neighborhood with easy access to the beach. Many days we were the only ones on the beach. We will consider renting again. This is a nice cozy beach cottage. The beds are quite firm. The walk to the beach is through the sand dunes and bushes that are very tall. We used the public beach access walk that is just 2 houses down. It is a quiet neighborhood . Within 5 minutes of all grocery and restaraunts. We would stay again. Our stay at Atlantic Dream was perfect. The fact that one of the family members wasn't able to make it added to this. The home was quite comfortable for eight but I think it would have been crowded had there been twelve. We had a wonderful breeze which keep the mosquitoes down but didn't help with the surfing---a bit rough. The location was wonderful--a nice bike ride from the A Street rental place--and not to far from Napoli's where the husband got his fill of calamari. I loved having the screened in deck plus the outside open area for eating and the top sun deck for observing sunrises and sunsets. The kitchen and bath supplies were plentiful--having two sets of dishes made it so that we only had to run one load a day. Be sure to tell future guests of your supply of beach toys should they have wee ones--plenty of boogie boards and sand items. This is not what one would refer to as a 'luxury' home but it was a very comfortable one. Thanks for the time there. My family and I had a great time at the house, with such nice views from all over. Spacious and comfortable. Saw moon rise, sun rises, pelicans and the weather was great. We had a wonderful time with our daughter and our granddaughters. We had a castle builing contest on the beautiful beach. Loved the roof top deck and the peaceful setting of the rental. We had a great family get together and great weather to go along with it. Would recommend cleaning up what appreared to be a water feature in the back. The crows nest deck was great and would seriously consider this property again for rental. Plenty of room and obviously the owner cares. Loved the brand new decks overlooking the ocean!